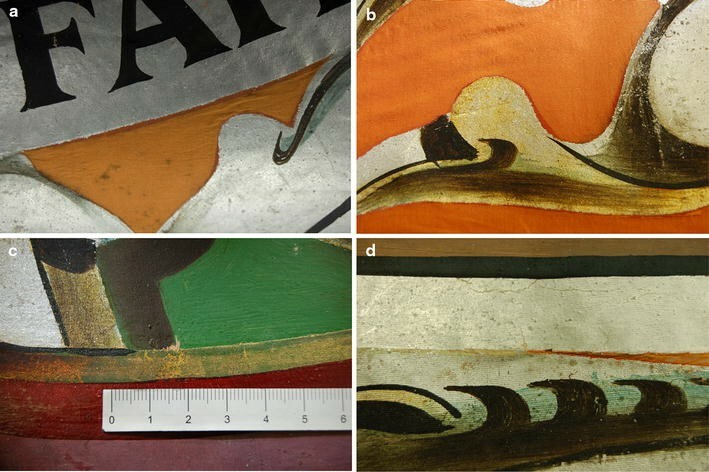 This paper investigates a range of analytical techniques to yield information about the materials and processes used in making painted banners. A textile conservator, technical art historian and paintings conservator, and materials scientist have joined forces to develop a greater understanding of the potential of analytical findings in the identification of materials. Visual examination using low level magnification and microscopy proved to be a crucial starting point and for identification of areas for further analysis. High magnification microscopy of cross sections was invaluable to gather information regarding the build-up of the layers, their interaction and condition. Scanning electron microscopy (SEM) of ion-milled samples showed that different areas of the banner had been prepared in different ways. SEM-EDX (scanning electron microscopy energy-dispersive X-ray spectroscopy) confirmed the presence of the main elements of pigments. Raman enabled identification of specific pigments. Raman also provided confirmation of specific materials (such as the paint filler). Fourier transform infrared spectroscopy with attenuated total reflectance (FTIR-ATR) enabled the identification of oil and resin, confirmation of pigments and fibres. Thin layers made sampling and identification challenging. Presence of materials such as silk and lead white dominated some analysis making interpretation of other materials more difficult. Sample preparation had a significant bearing on the effectiveness of the analysis. Ion-milling provided high quality surface on the cross section samples that enabled material interfaces to be clearly seen. The challenges of finding effective wavelengths for analysis of samples using Raman were clearly evident in this study. Microscopy showed fibres blends, easily missed using FTIR, whereas FTIR was particularly effective in the identification of man-made fibres. While portable instrumentation may be useful, for in-depth understanding of the heterogeneous layered materials sample taking still remains crucial. Commercial makers used many typical grounds and pigments but these were used sparingly, in thin layers, in order to produce a flexible object and also perhaps to reduce costs. The textile was however of high quality, in this case silk. Unexpectedly, the preparation layers do not appear to be consistent across the banner; the reasons for this need further investigation. Banners are iconic objects. Many images have been captured showing them billowing in the wind embellished with bold designs as they were carried on procession. They were and are still widely used by political groups, trade unions, friendly societies, churches and women’s organisations . Early banners were painted by sign writers, coach painters or decorators but during the nineteenth century many were made by commercial companies such as George Tutill and Co. and Toye, Kenning and Spencer. Many different materials (e.g. silk, cotton, linen and man-made fibres) and paints (e.g. oil, watercolour, acrylic) have been used. Banners are painted on one side or on two sides of the same fabric or consist of two painted fabrics sewn together. In most cases the paint does not cover the entire surface of the fabric. As they were designed to be carried they have poles sleeves or hanging tabs along the top and sometimes also on side edges. Despite the uncovering of hundreds of painted banners in many collections in the UK, we still know very little about their materials, construction and factors affecting their degradation. In recent years, textile conservators have been working more closely with scientists to develop a better understanding of the materials that comprise banners and painted textiles in general [2, 3]. In this study, the analysis of a typical marching banner is carried out to determine the value of techniques commonly used in the analyses of both paintings and textiles, and their appropriateness for the identification of materials and degradation processes, to inform conservation and collection care as well as add to the historical understanding of these objects. Knowledge gained through the different analytical stages shows the potential of each technique and the difficulties that these techniques present. A 1950s banner from the manufacturer George Tutill & Co. is used as a case study for this purpose. The identification of materials is done using widely utilised instrumentation such as microscopy, scanning electron microscope (SEM), Fourier transform infrared spectroscopy (FTIR), Raman etc. In addition to identifying the materials, the challenges associated with these types of objects in terms of sample preparation and subsequent analysis is discussed. Lastly the use of specialised preparation techniques such as ion-milling are reported. The results will enable conservators to see the value of materials analysis to their work. This study of a hierarchy of analytical techniques shows the role of different techniques in developing our understanding of painted textiles. The banner used in this study belongs to the Karen Finch Reference Collection housed at the Centre for Textile Conservation and Technical Art History, University of Glasgow. 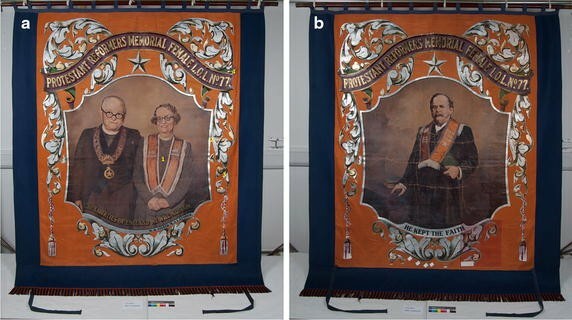 It is a marching banner, measuring approximately 230 cm × 245 cm and depicting the Loyal Orange Lodge (Fig. 1), made by the company George Tutill & Co., and is thought to date from the 1950s . The banner comprises a single layer of dyed orange textile with dyed blue textile borders on three sides. Guide tapes are attached near the bottom of the banner and can be seen in Fig. 1b. It hangs from a wooden pole by textile tabs and is decorated with a blue and orange fringe on the lower edge. The textile components are machine stitched together. The pole has a metal cap on each end with rings which would have been attached to wooden side poles when the banner was carried in a March. The central orange panel is painted on both sides. The paint does not cover the entire surface and there are large unpainted areas. The paint covers the same area on both sides but each side depicts a different design. Four positions were sampled (1–4, Fig. 1) in a number of different ways in order to fully explore the material composition of the banner. For the purposes of this research the location of the samples is referred to from the front of the banner. Samples were taken from areas where there was previous damage and/or sampling had already been carried out. Full sections of ca 1–2 mm2 were taken by cutting through the banner using a scalpel to obtain a complete cross section for examination. Samples of only the paint layers were also taken from areas where different colours and types of paints (matt, translucent and metallic) were used. It was not possible to take paint samples close to the edges of the banner as could be done with a painting because the silk extends beyond the painted image so such sampling from a banner in good condition could be problematic. The wood and metal were not sampled. Table 1 details the sampling methods and positions. Reconstructions of silk fabric coated with a preparatory layer of latex rubber or rabbit skin glue followed by a paint layer of zinc white pigment mixed with linseed oil were made in order to determine if the analytical methods used to identify the materials were successfully detecting the materials in each layer. These were created based on a 1861 patent (George Tutill & Co.) for the preparation of painted banners, as published by Labreuche  who reported on the nineteenth century use of latex rubber in the preparation of painted canvases, and on a discussion with banner makers George Tutill Flags (April 2014). Low magnification microscopy was carried out using a Zeiss stereo-microscope (Stemi SV 11). Loose fibre samples were studied using a Zeiss Axiolab Pol (polarising microscope). Embedded cross sections were prepared from samples by mounting them in clear light curing resin (Technovit 2000LC, Kulzar). The resin blocks were prepared in silicone moulds and were cured in a UV curing unit (Technology Cu, Heraeus) for 30 min. The final polish was carried out using 12,000-mesh Micro-Mesh® polishing paper. Although the polishing removed the majority of the resin some remained on the sample due to the non-conformal nature of painted cross-section. In addition it was difficult to polish painted textile to the same level of traditional oil paint cross-section because of the presence of the textile fibres tended to be abraded unevenly. Embedded cross sections were examined under visible and ultraviolet illumination using an Olympus BX41 microscope and Olympus Stream Start 1.8 image analysis software. Samples of the banner were viewed using an energy-dispersive X-ray (EDX) micro-analysis in conjunction with scanning electron microscopy (SEM–EDX), Camscan DX 4800 scanning electron microscopy and secondary electron, backscatter electron and absorbed current detectors (SEM-BSD, SE and AEI) and a Carl Zeiss EVO MA15 variable pressure W SEM with Oxford Instruments AZtecEnergy EDX system with 80 mm X-Max SDD detector-secondary and backscattered imaging, EDX elemental mapping and linescans plus CZ STEM detector. The analysis depth is commonly around 1 to 2 µm and the lateral dimensions tend to be about 1 µm. The quantitative results progressively improve as the element becomes heavier. To achieve very smooth surfaces, some samples were ion-milled using a Hitachi IM4000Plus ion polisher. The following instrumental conditions were used: flat milling with sample rotation and periodic beam irradiation interruption, beam-on for 1 rotation (25 rpm, means 2.4 s), beam-off for 27.6 s (30 s period) total processing time 99 min (beam-on total 475 s), beam energy 4 keV, beam current ~135 µA, and irradiation angle 60° from vertical and zero excentricity. Fourier transform infrared spectroscopy with attenuated total reflection (FTIR-ATR) was carried out using Perkin Elmer Spectrum One FTIR Spectrometer with Spectrum software version 5.0.1 and fitted with a Universal ATR Sampling Accessory. The ATR crystal used was a diamond/thallium-bromoiodide (C/KRS-5) with a penetration depth up to 2 µm ATR-FTIR is primarily a surface technique and the exposed diameter of the crystal was 1.33 mm resulting in a sample area of around 1.39 mm2. 32 scan accumulations were used at a resolution of 4 cm−1. Micro Raman analysis was carried out on two instruments which allowed the use of a total of four excitation wavelengths. The first instrument was a Renishaw inVia Raman Microscope, with Wire 3.4 software. It was calibrated using silica at 520 nm. Two excitation wavelengths were used for analysis; a gas laser source at 488 nm wavelength with a possible maximum power of 10 mW and a diode laser of 785 nm wavelength with a maximum power at sample of 200 mW. Full power was never used for either wavelength and was 5 % or less of full power. The 488 nm excitation wavelength grating had 2400 lines mm−1 and the 785 nm excitation wavelength has 1200 lines mm−1 both had a 1040 × 256 CCD detector. Further work was done on a LabRAM HR system, manufactured by Horiba Jobin–Yvon equipped with a Ventus 532 laser system 100 mW and a Helium Cadmium IK3201R-F, 20 mW, 325 nm, using a 1024 × 128 CCD detection system. Analysis was carried out on this instrument using excitation wavelengths of 532 nm and 325 nm, with gratings of 600 and 1200 lines mm−1 respectively. On both instruments the samples were focused using 20× and 50× objectives. The spectral resolution ranged from 1 to 4 cm−1 depending on the wavelength employed and the measurements were performed with a slit opening of 65 µm. The banner was examined by eye and with low level magnification. Through this process it was possible to determine a broad categorisation of materials, the banner’s construction and painting techniques. 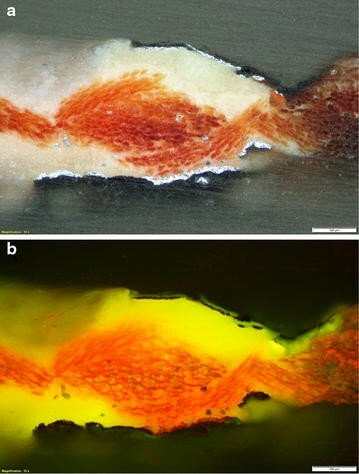 Close study of the textile-paint interface indicated evidence of a possible preparatory layer applied directly to the silk (Fig. 2a). Figure 2b shows a transparent yellow toned coating/varnish layer over the silver-coloured paint to create a gold colour that appears to overlap onto the silk. These preparatory layers, paint layer and the coating/varnish have considerably stiffened the silk. The condition of the textile, paint and paint-textile interfaces including presence of soiling, creasing, splits and abrasion were documented based on visual and low-level microscopy. The differences in flexibilities between the painted and unpainted areas were evident. Paint deformation resulting from previous storage around the narrow banner pole and areas of paint loss associated with flexing and creasing are evident (Fig. 2c, d). Some of these distortions may be the result of different flexibilities of the materials but also different responses to environmental conditions between the painted and unpainted areas. This damage is typical for banners . 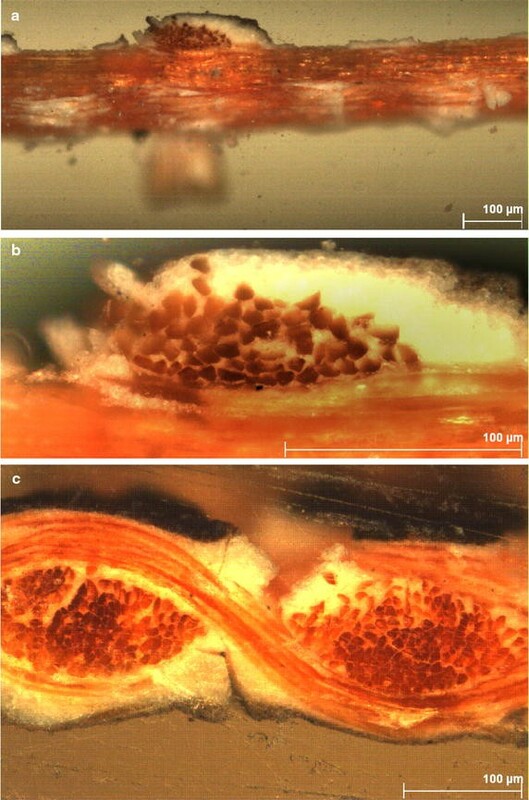 Under low level magnification micro-cracking of the paint surface and paint losses (Fig. 2c, d) were visible, particularly on the areas with several layers of paint. Due to previous substantial damage it was possible to be able to take cross-sections that comprise the whole layer build-up of the preparatory, paint and varnish layers on both sides of the silk support. Fibre identification, longitudinal and cross section, was carried out on the banner and the fringe. The banner was identified as silk and the fringe was a mixture of cotton and a man-made fibre. The man-made fibre was confirmed by FTIR as viscose rayon. Polarised light microscopy from P1 (Fig. 3) shows a layer build up starting with a white preparation/priming layer of ca. 50 µm that seems to have impregnated the silk support on both sides. This is followed by one thin further paint layer on each side of the banner (ca. 10 µm). A similar white ground has been found on many mid nineteenth to early twentieth century processional painted banners, most of them on a silk support [2, 7]. In P4 (Fig. 4) there is a silver coloured paint layer which was identified as aluminium (see SEM-EDX results) (ca. 10 µm), which in some places of the cross-section is covered by a transparent yellow layer, discernible in UV, applied to make the silver coloured paint appear golden. Figure 5 shows a loose sample again of the white ground layer with a red paint layer which appears glossy due to a coating of a resin based varnish (see FTIR results). Protein staining was carried out on embedded cross sections following a method detailed by Schäfer . The metal chelate stain, SYPRO® Ruby was used as it is readily reversible, does not modify the protein and is compatible with mass spectrometry. Figure 6 shows an embedded sample from P3. It can be seen that the silk, a large part of the sample, stains as it is a protein. The method was developed to identify and localise the presence of protein in historical paint cross sections. Here it also functions to indicate the protein fibre component, silk. There is also evidence for a protein type material within the areas where the metallic paint has been used. However, it is not possible to identify from this test alone which type of protein it is. An analysis technique such as gas chromatography with mass spectrometry would be required to do this . Figure 7 shows a scanning electron microscopy (SEM) image of a loose sample taken from P1. 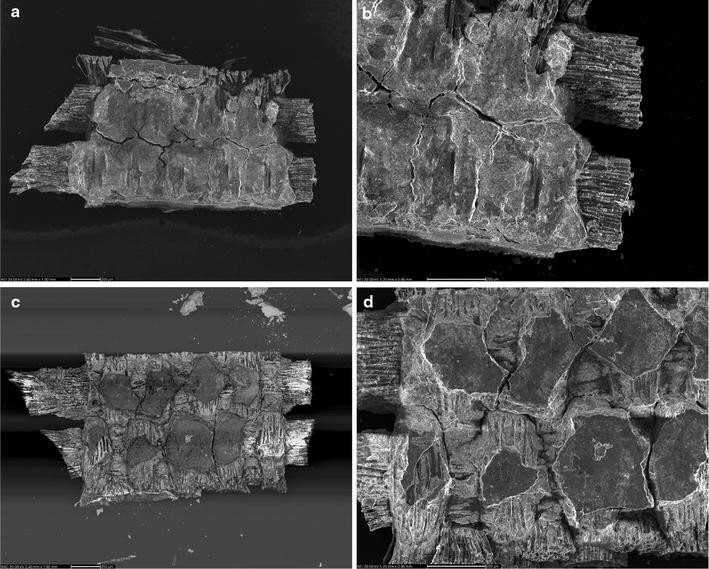 A cross section sample taken from P1 was examined on both sides using SEM-EDX. Analysis of the back of the banner detected lead and traces of aluminium, silicon, potassium, sodium and calcium. The lead is likely to be attributed to lead white commonly used as a ground layer in banners made by Tutill . Analysis of the metallic paint (P2) showed the presence of aluminium which is frequently used in metallic paints to give the appearance of silver. Ion-milling to produce high quality smooth samples has been used in materials analyses for a considerable time  and was investigated here. Ion-milling involves hitting the sample surface with accelerated submicron ion particles while it is mounted on a rotating table inside a vacuum chamber. Its first reported use in a cultural heritage application was published in 2006 by Boon and Asahina . Subsequently work by Prati et el. [12, 13] has shown the advantages of ion-milling embedded paint samples. 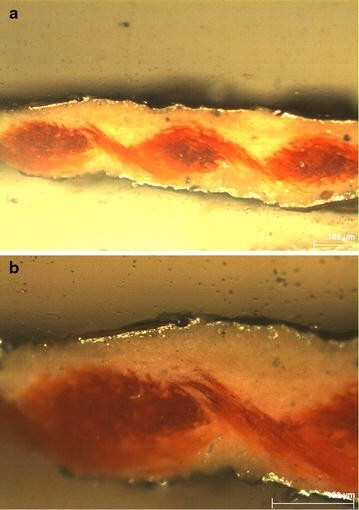 Figure 8a, b shows an embedded sample before and after ion-milling, demonstrating the high structural definition of the different materials and distinctive layers not routinely seen with traditional polishing techniques. Figure 9 shows ion-milled samples (a and b) taken from P1 and P4 respectively indicate that different preparation techniques have been used on the same banner i.e. Fig. 9a shows the inorganic materials from the ground layer spread though out the silk fabric while Fig. 9b shows a preparatory organic layer on the silk fabric preventing the ground paint from having contact with the silk. This use of different preparation techniques on different parts of the same banner has not been reported before. All the FTIR analysis was done using the external ATR arm and thus is considered macro (bulk) analysis. A large range of materials was identified. Samples from the fabric and fringe were analysed with standards from a fabric supplier (Whaleys, Bradford, UK) used as reference material. FTIR-ATR confirmed the use of silk for the fabric and a mixture of viscose rayon and cotton for the fringe. Figure 10 shows the spectrum obtained from side 1 of a sample taken from P4 compared with a spectrum of new silk. The amide I and amide II bands at 1620 and 1514 cm−1 respectively, are associated with the fibroin component of the silk. Other fibroin related bands at 1442 and 1164 cm−1 arise from the vibrations of the side chains of alanine and tyrosine in the silk . FTIR gave a clear molecule signature for silk. Figure 11 shows the spectra obtained from the two thread types taken from the fringe on the bottom of the banner. One thread type has been identified as cotton and the other as viscose rayon. The FTIR spectra of these materials are very similar. However, a peak around 1100 cm−1 associated with the glucose ring is present in cotton but missing in the viscose rayon. Figure 12 shows the spectrum of sample P1 compared with spectra of linseed oil (aged), calcium carbonate, lead white and silk. It is not possible to identify any of the materials with 100 % certainty as often broad bands mask the presence of narrow bands that would appear within their area. However, bands at wavenumbers specific to linseed oil, silk, calcium carbonate, and lead white were detected. Linseed oil has very strong CH2 asymmetric stretching at 2920 cm−1 and strong CH2 stretching 2850 cm−1. The C=O stretching is seen around 1740 cm−1 and C–O ester stretching at around 1160 cm−1. The broadening of the C=O peak at 1740 cm−1 is indicative of the hydrolytic degradation of triglycerides which leads to the formation of the free fatty acids which is seen here . Additionally the peak at around 1706 cm−1 may be associated with fatty acids formed by hydrolysis of glycerol esters . Lead white has a strong band at around 1370 cm−1 assigned to the CO 3 −2 and a band around 680 cm−1 both seen on the banner spectrum. Calcium carbonate also exhibits a broad band around 1392 cm−1 but additionally at 872 cm−1 which is seen here. Silk is also seen at 1618 cm−1, 1531 cm−1 associated with the amides I and II. The banner exhibited areas of an opalescent bloom previously reported to be present on marching banners and which could be attributed to the formation of metal soaps [17, 18]. The simultaneous presence of free fatty acids in the binders and metals from pigments make the formation of soaps predictable . However micro-pitting of the paint surface or mould are also known to cause bloom. The spectrum of a sample from P4 showed two strong sharp bands between 1500 and 1600 cm−1 one at around 1586 and another at 1538 cm−1 as a result of COO- asymmetric stretching associated with calcium soaps [20, 21]. The CO 3 −2 of CaCO3 creates a broad band at around 1400 cm−1 which masked the symmetric bands of the calcium soaps. However by performing first derivative calculations, the overlapping peaks could be seen at around 1472, 1433 and 1420 cm−1 which are all absorbance bands present in calcium soaps. The formation of the soaps is also confirmed by the reduced presence of the C=O ester and acid stretching at 1700–1750 cm−1 associated with the linseed oil components. Despite the presence of lead white detected on most of the samples from the banner the formation of lead soaps, on the samples analysed, was not detected as the doublets associated with lead soaps occur at lower frequencies 1540–1500 cm−1  and these were not seen on the spectrum. However, this may be due to the use of macro FTIR and it may be that the use of micro FTIR may have found these soaps to be present. Therefore it cannot be deduced from these results that they were not present. 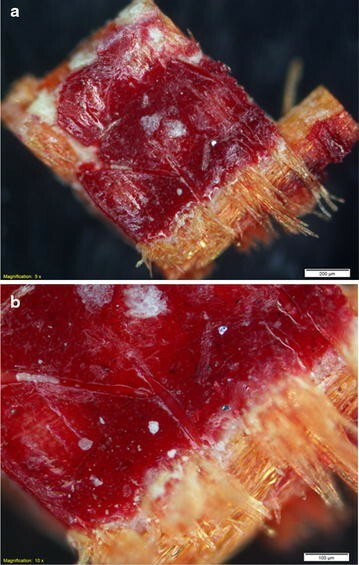 A sample from the red translucent paint at P4 (see Fig. 5 for light microscopy image) appeared to contain a resinous material and produced a spectrum indicating that it was possibly shellac, as a broad doublet type C=O band around the lower regions of 1700 cm−1 was observed as well as a band at 1636 cm−1 associated with the C=C bonding. Identifying differences in spectra between aged drying oil and resin proved difficult as the C=O band broadens to lower frequencies in oil due to ageing. However, the vinyl band at 1636 cm−1 present in shellac but not oil and a strong band at 1160 cm−1 in oils which is weaker in shellac can help differentiate. Additionally the C=O doublet seen in shellac resin is not seen in drying oil. Figure 13 shows the banner spectrum compared with shellac (supplied A.F.Suter, London). For confirmation of shellac the detection of erythrolaccin (a yellow dye present in shellac) could be achieved using high performance liquid chromatography. Attempts to identify the possible unknown preparatory layer which was visible by eye and on the ion milled samples (Fig. 9) were explored. Spectra were compared with a spectrum of latex rubber known to have been used on painted banners  and rabbit skin glue commonly used on paintings. Neither of these was detected on this banner using FTIR. The FTIR analysis of the reconstructions showed that some combinations of materials are very difficult to detect. The spectrum of the combination of silk fabric coated with a 20 % (aq) latex rubber solution is shown in Fig. 14a. Here it is possible to see the absorbance bands associated with silk but the latex rubber bands are not easily identified despite their occurrence at different areas on the spectrum. Figure 14b shows the spectrum of the silk with 10 % (aq) rabbit skin glue. As would be expected, as both are proteins, it is not possible to identify the presence or absence of rabbit skin glue. This problem with using this type of analytical methodology to analyse multi-layered samples has been noted . Often characteristic absorptions of some materials are masked by stronger bands of others. Therefore we cannot conclude from the FTIR results that a preparatory layer is not present only that it cannot be detected in this case. Fourier transform infrared spectroscopy microscopy was not carried out here. This technique is able to achieve high spatial resolution and gains in sensitivity in detecting trace materials and it may have yielded information on the specific location of materials in the unembedded samples. However, the problems associated with bands from resin interference in embedded samples often prevents identification of oils resins etc. as the absorbance bands associated with these appear in the same parts of the spectrum. Much research is being done to prepare successful cross sections in materials which have less detrimental effects on the analysis [24, 25]. Work concentrated on optimising micro-Raman analysis conditions, by using different excitation wavelengths, exposure times and power settings to detect the differing materials within the samples. Additionally care was taken to choose settings which did not damage the sample through overheating. Analysis at 488 nm yielded poor results for the embedded samples as all spectra were badly affected by fluorescence. A loose sample from P1 did produce a spectrum but required a high power setting of 50 %, which could potentially damage the sample. Using lower power settings yielded no information. In contrast using an excitation wavelength of 785 nm, exposure time of 10 s and power setting of 0.1 % on an embedded sample from P1 produced a good spectrum from the dark area (top paint layer). The peak at 544 cm−1 has been identified as red lead by comparison to a minimum standard, a red lead mineral (supplied by National Museums Scotland Collection), Fig. 15. The peak at 1086 cm−1 visible on the spectrum of the embedded sample is indicative of calcite (calcium carbonate) which is often used as pigment filler [26, 27]. Using 785 nm and 0.1 % power produced good spectra for lead white in both embedded and loose samples. Figure 16a, b show spectra of lead white. Figure 16a shows the spectra as they were collected and Fig. 16b shows them with baseline smoothing and the wavenumber range reduced. The detection of lead white occurs at around 1050 cm−1 (when compared to the spectrum produced from the lead white mineral cerussite, RRUFF database) in the samples P1 embedded, P1 loose sample and P3 loose sample. Additionally a good spectrum for the identification of lead white was achieved using the Renishaw system at 325 nm for a loose sample from P1. The use of Raman to identify the silk in embedded and loose cross sections proved to be difficult. Figure 17 shows the spectrum of embedded silk at the 785 nm excitation wavelength showing it was difficult to obtain a good quality spectrum for silk for an embedded cross section due to the extent of fluorescence from the resin block as well as the fibre. However, with baseline correction and truncating of the sample spectrum two peaks were identifiable when compared to the spectrum obtained from a loose silk sample (new), one being associated with silk 1665 cm−1 but the other (1588 cm−1) most likely due to the embedding resin (see Fig. 17). This problem was noted by Macdonald et al. when analysing cross sections of banners with Raman. Problems with intense fluorescence signals from organic materials and dyed fabrics have been documented [28, 29]. These signals often mask the signals for the lesser reacting molecules. The use of confocal Raman microscopy has been reported as a way to prevent this  and Lorenzetti et al. reported on its usefulness to determine the dyes on historic dyed cotton yarns by using a confocal condition 2–3 µm lower than the fibre surface. However Macdonald et al. reported that the results often included output from both above and below the point of focus and so these contributed to the Raman response albeit to varying degrees. Thus the use of confocal microscopy may not be ideal as it is not always certain which area in the sample yields the results. When using Raman to analyse samples from painted textiles the presence of the textile such as silk, as well as the typical organic oils and resins associated with pigments, mean that fluorescence signals will be strong from such samples so care has to be taken when processing these results. In summary a total of four different wavelengths were used in the analysis, ranging from 325 nm in the ultra-violet range, 488 and 523 nm in the visible range and 785 nm in the infrared region. The analysis of cross sections, either loose or embedded, was most successful using an excitation wavelength of 785 nm. Relatively strong signals were obtained using short scan times typically of around 10 s. Using the excitation wavelength 325 nm reduced fluorescence but failed to detect pigments, excepting lead white, or silk with any degree of certainty. Similarly Burrafato et al. compared the use of three excitation wavelengths 531.5, 632.8 and 780 nm for the identification of pigments both dry and in egg tempera, casein tempera, oil and fresco. They reported that the presence of other materials often made detection difficult or impossible e.g. cinnabar in oil could only be detected using 780 nm. The use of Fourier Transform (FT) Raman at 1064 nm has been reported to be useful for the determination of organic materials such as dyes as it does not suffer from fluorescence interference. The signal from the sample is weakened at this wavelength  however the use of a sensitive single element such as indium gallium arsenide or liquid nitrogen-cooled germanium plus an interferometer converting the Raman signal greatly improves the output. Perhaps this wavelength’s use, due to reduced fluorescence, would have helped in identification of some materials here. From the samples analysed a range of pigments, lead white, calcium carbonate and red lead were identified. EDX alone detected the presence of aluminium which was a component of the silver coloured paint used. The presence of oil was detected as a component within the pigments with no indication that the recently developed acrylics had been used. Shellac was most probably used to create a glazed appearance on the banner and also used to coat the wooden support pole. George Tutill and Co. manufacturing banners in 1837, using oil paints for its designs and traditional pigments. By the 1950s however, the company would have had availability of a wide range of paints with a variety of binding media and modern, synthetic pigments, as well as metallic, such as the aluminium paint, and enamel paints, much in accordance with what artists were using and experimenting with . However, traditional oils were still used in the banner despite the availability of more modern paints. Table 2 summaries the materials identified and the techniques used. Visual examination using low level magnification and microscopy proved to be a crucial starting point to understand the nature of the materials being studied and to identify areas for further analysis. It is clear that important information can be gleaned from visual observation and low level microscopy. A cross section through all layers was invaluable to gather significant information regarding the build-up of the layers, their interaction and condition. Sampling paint alone was problematic as the paint layers were very thin and crumbled easily and it proved difficult to sample the layer closest to the silk. Additionally the flexibility of the silk also created more movement than sampling from a taut canvas. Sample preparation had a significant bearing on the effectiveness of the analysis. Ion-milling provided high quality samples for SEM that enabled the material interfaces to be clearly seen. Of particular interest was the presence of an organic preparatory layer on some areas of the silk which may explain the darkening on the silk around the edges of the paint. This was not visible on samples which were prepared by polishing with cloths. Scanning electron microscopy energy-dispersive X-ray spectroscopy confirmed the presence of main elements whereas Raman enables identification of specific compounds. The challenges of finding effective wavelengths for analysis of samples using Raman were clearly evident in this study. Previous work using Raman by Macdonald et al. concentrated on identification of paint pigments used in painted banners as the authors stated that this would assist conservators to understand degradation as well as helping with dating and attributions. This is certainly true but to determine where degradation has occurred other materials (such as base and preparatory layers, grounds and varnishes) used in painted banners must also be identified. Raman analysis also provided confirmation of specific materials (such as paint fillers) which is useful in building a better understanding of the banners. Fourier transform infrared spectroscopy with attenuated total reflectance enabled the identification of oil associated with the pigment, shellac used for glazing and coating the support pole, further confirmation of pigments and man-made fibres. The use of microscopy (longitudinal and cross section) was very effective and clearly showed mixed fibres. FTIR was particularly valuable in identifying manmade fibres as they can be difficult to determine using microscopy alone. This highlights the value of comparative techniques and is an important consideration, as fibre blends are not uncommon in banners. The use of other non-invasive techniques will be important to be able to study a wide range of banners. Portable instrumentation, although not reported here, is obviously of great value in the study of painted banners as these will give a preliminary result which for example may identify a material or show surface cracking. However, portable FTIR (for example ATR and diffuse reflectance infrared Fourier transform spectroscopy-DRIFTS) is not always the best option when dealing with uneven, partially degraded, multi-layered materials as the depth of penetration could lead to erroneous results due to the complexity of spectra produced. Portable Raman may not be suitable due to the levels of fluorescence caused by the organic materials. However their application using different wavelength detectors would need to be further investigated to determine its usefulness to fully understand painted textile materials and construction. The focus of this investigation was to systematically identify the types of materials used by the banner maker which is crucial to not only understanding the materials used in its making but also to inform conservation. This included not only the textile and paint but also other components such as the coating on the wooden banner pole. Understanding the characteristics of all materials is considered important as some materials present may contribute to accelerated degradation of others. The presence of the silk textile resulted in more complex experimental sample preparation and also problems resulting in interference signals from the textile during some instrumental analysis. These range from the problems encountered in FTIR with dominant signals in macro analysis which results in materials not being identified to the problems of protein stains where the presence of silk can obscure other proteins which are only present tiny quantities. The challenges of finding effective wavelengths for analysis of samples using Raman were clearly evident in this study. Sampling provided very valuable information about the banner’s construction and materials; this is a well-recognised technique used in paintings analysis for conservation. The full cross section including the textile, albeit destructive, in particular yielded not only information about the banner’s materials but also their interfaces which is crucial in understanding the composition and also to better understand its manufacture, and deterioration. This is essential to inform conservation. However taking full cross section samples would not be possible on many banners, unless there was significant damage through the painted areas, and where the paint does not extend to the edge of the object. Taking any sample from a painted banner is challenging due to the fact that the textile is not rigid and also that the paint layers are extremely thin (often around 10 µm). This means that it is difficult to achieve a cross-section of the paint layers alone as the thinness causes the paint to crumble. This is not necessarily the case with samples from paintings where the layers are usually much thicker. Sampling from a variety of areas is important as materials and preparatory layers may vary within a banner as reported here and although portable instrumentation may be useful for in-depth understanding of the heterogeneous layered materials sample taking still remains crucial. While instrument manufacturers increasingly develop instruments that are ‘easy to use’, ultimately the value of analysis should be in rigorous interpretation and knowledge of the limitations of the instrumentation, something that can only be achieved by an understanding of the scientific principles behind the analysis. Conservation scientists perform a valuable role for conservators and curators who often only wish to identify or confirm the presence of a material, leading to the publication of many extremely enlightening and informative technical papers, but the results do not always speak for themselves. More in-depth examination and interpretation is required in order to fully understand interactions at interfaces and surfaces which will in turn help the conservator to understand and more effectively preserve these socially significant cultural objects. MJS and KT prepared the samples, performed analyses, interpreted the results and wrote the paper. EH carried out the interpretation of the light microscopy samples. All authors read and approved the final manuscript. Margaret Smith was funded by the Getty Foundation through the Research Network for Textile Conservation, Dress and Textile History and Technical Art History and AHRC Grant AH/M00886X/1. The authors wish to thank Frances Lennard for useful discussion during to preparation of this article. Also the authors which to thank the following people for their help in carrying out the analysis, Dr. Mark Richter, University of Glasgow; Dr. Lore Troalen, National Museum Scotland; Prof Anne Neville and Dr. Chun Wang, Institute of Functional Surfaces, University of Leeds and Mike Dixon and Dr. Thomas Schmidt, Hitachi Instruments.